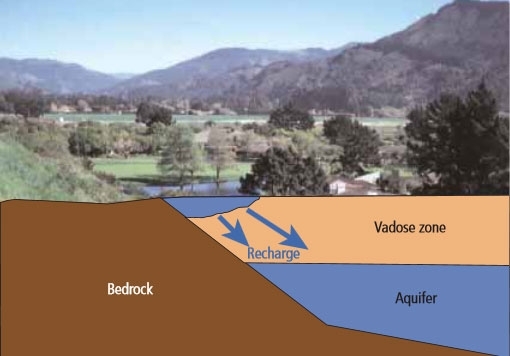 Groundwater is a vitally important natural resource in California. It can be challenging to imagine the stores of water underlying California. But Thomas Harter, UC Cooperative Extension specialist in the Department of Land, Air and Water Resources at UC Davis, shares a vivid vision of the state's vitally important groundwater resources. In a videotaped presentation, Harter said California's Central Valley is like a giant bathtub; its walls are the Sierra Nevada and coast mountain ranges. Clay, silt, sand and gravel washed into the bathtub over millions of years and fresh water from streams, rivers and rainfall soaked into pores between sand and gravel pieces, between clay and silt particles, and in the fissures and cracks in rocks, where it has accumulated for eons. Harter outlines the nature of California's groundwater situation in a 30-minute video that is part of the UC California Institute for Water Resources online video series. The series consists of presentations featuring UC and other experts speaking on topics aimed at helping farmers and all Californians better understand and cope with drought. In the 1920s and 30s, farmers began pumping groundwater in vast quantities to grow summer crops on the flat dry surface. It wasn't long before the land began to sink, especially on the west side of the San Joaquin Valley and in the Tulare Lake Basin. “Land surface levels declined as much as 30 feet during the 20th century,” Harter said. In the 1970s, the state water project made surface water supplies available to farmers, allowing underground water to recover. However, in the last 10 years, as surface supplies have declined, farmers are drilling deeper wells to irrigate crops. Once again the land surface has begun to subside, Harter said. For the most part, farmers have free reign when it comes to pumping groundwater. “Landowners are not owners of the groundwater below them,” Harter said. “But they have the right to use the groundwater.” There is a constitutional mandate that all groundwater goes for beneficial use. In the video, Harter reviews the tangle of regulations and agencies involved in managing the state's groundwater. “About 42 percent of groundwater basins in California have some form of groundwater management plan,” Harter said. The plans contain some basic elements, but are lacking in terms of enforcement mandate, integration with surface water management and the power for agencies to manage demand.